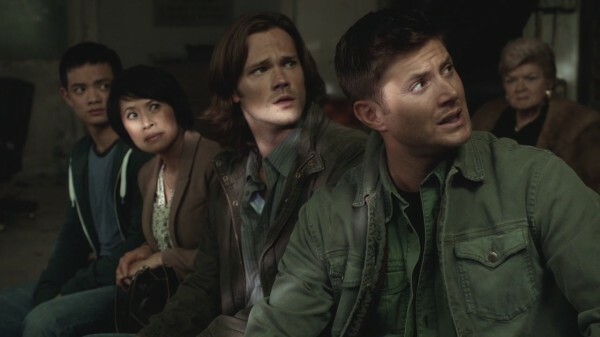 The Winchesters get more passengers in the Impala’s backseat and viewers get a chance to see how awesome Kevin Tran’s mother is. With the tablet still in play and the brothers working their way back to Winchester-normal, the road to a demon-free life was never going to be easy. This episode was all about Mrs. Tran. Yes, we had an auction and some pretty great ancient relics up for sale, but the shining moment throughout the storyline was definitely Kevin’s mom. The brothers are on the road, bringing Kevin along for the ride, and their different mindsets are already evident. 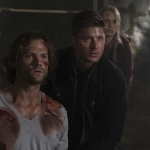 While Kevin wants to check on his mom and ensure her safety, and Sam seemingly okay with that plan, Dean is more concerned with the mission at hand. He doesn’t want to waste time detouring for a woman who has no part in making sure demons get banished from the world. What happened to “family is important”? I guess that Dean Winchester doesn’t exist anymore. Or maybe that devotion only applied to his own family. At any rate, Kevin’s desires win out over Dean’s refusal, which allows us to get to know a great female character — Mrs. Tran. While she mourned for her lost son for a year, once he rejoins her and she gets the inside scoop on who he is and who these Winchesters are, she seems surprisingly accepting. Maybe too accepting? I’m not sure yet if there was something else going on with her or if she’s just that cool. I’m going to stick with the latter explanation unless I see differently. She’s a mom, through and through, and she’s tough enough to prove it. When Dean’s interrogation techniques don’t work, Mrs. Tran is there with another tactic that does. And when Crowley threatens, she’s the one that punches the King of Hell right in the jaw. Go, Mrs. Tran! And not only did we get a woman who could stand on her own, but also scenes dealing with the tattoo. 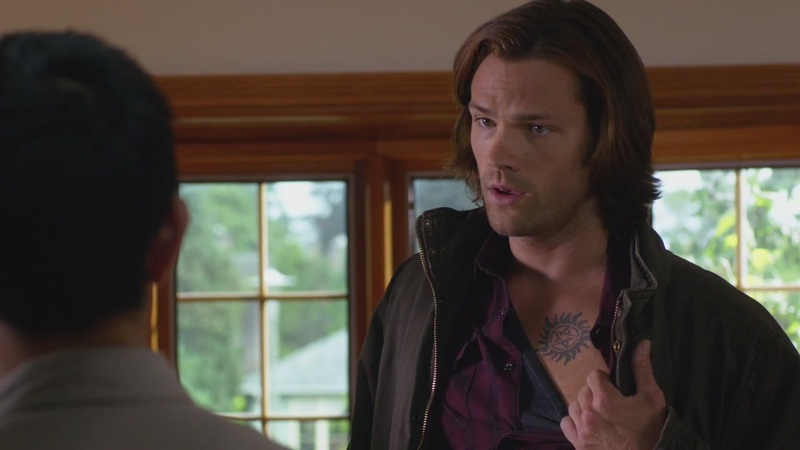 Kevin and his mom have to get inked, just as Sam and Dean have been, and to illustrate the point we get Sammy showing off his tattoo. I am all for seeing the boys flash their ink anytime they want to show it. What I noticed this time, though, was that the make-up department seemed to add a tiny little detail that might be easily missed. Sam and Dean have had their tattoos for five to seven years, depending on how the timeline has gone in canon, so they’re not going to be as shiny and new as when they first got them. Sam’s design, this time, seemed to be faded slightly, as if Sam really has been wearing it for all these years. It’s a subtle addition, but it made me happy. Of course there were other notable moments in the episode. In fact, there were plenty. Between the comedic bits and the Purgatory flashbacks, it seemed like this episode had something for everyone. I would be hard-pressed to choose which of the funny parts I liked the most. Dean setting off the metal detector as they entered the auction was spot-on. Of course he’s packing, he’s Dean Winchester. The buyer of Thor’s hammer was creepy, but the fact that Sammy was wielding Mjölnir in battle just made me laugh. Sam Winchester, the reincarnation of Thor. Hey, he’s even got the hair to prove it. And the reverse exorcism spell early in the episode was pure Winchester genius. How do you get an escaping demon back into a host body? Just say the exorcism backwards. Love it! We got a few more hints about Crowley in this episode, aside from the fact that he’s riding the mean streak for all it’s worth. He is able to possess others, of course, but he causes his host’s eyes to go red rather than the normal black. This matches the color of the smoke that escapes the host as he’s leaving them. What does that mean? Does it just signify that Crowley’s a higher-up demon? Or maybe he’s more than a demon? We still don’t have an answer to that, even after all these years. The whole tablet situation remains unresolved. They made a good effort to buy it at the auction, as did Crowley and the angel, but in the end, every component for the spell has been scattered out of reach for the Winchesters. 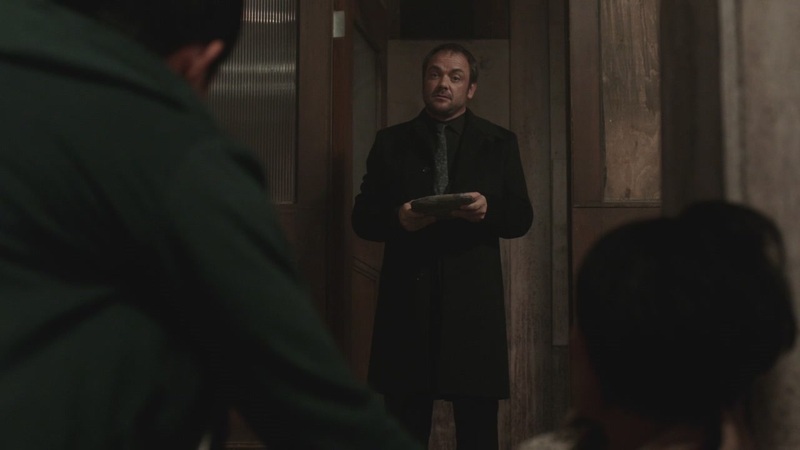 Crowley ended up with the tablet, after possessing Kevin’s mom, and Kevin took Mrs. Tran with him to go into hiding. Dean and Sam have nothing to show for their efforts. Then again, if it all worked out for them early on, we wouldn’t have a seasonal arc. 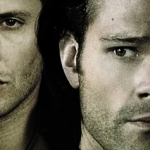 Though, I’m sure the Winchesters have enough issues to fill plenty of years of storytelling by themselves. Poor, broken boys. They make for great viewing. 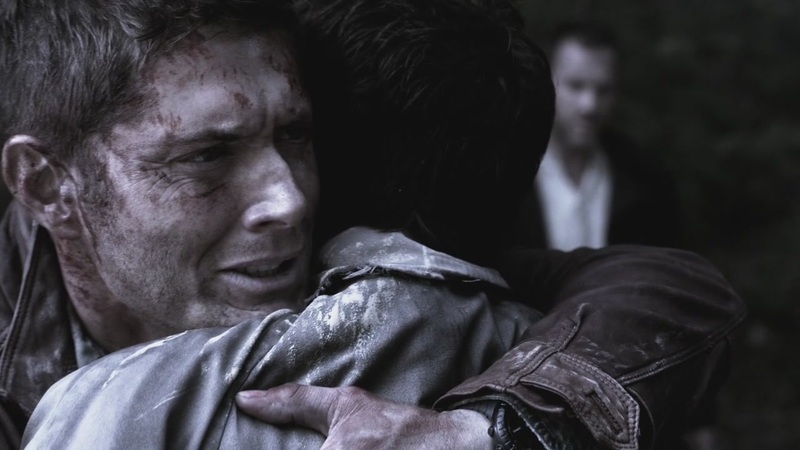 I’m looking forward to seeing more of Dean’s year in Purgatory unfold through flashbacks. I love the way they’re shooting these scenes, both through lighting and tone, as well as the story that is unfolding. Benny is a character that I see as having great potential, both in the way he’s bonded with Dean and in the inevitable meeting he will have with Sammy once the partnership is discovered. Dean is messed up from his time in Purgatory, of course he is, and the fact that he keeps getting lost in the memories makes me fear that one time he will go too far. While I liked seeing him rough up the suspect as he did, there’s always the potential that he won’t be able to discern present from past and will take a life when he’s not supposed to. Purgatory was pure, but life topside is not. He’s also got to live with the memory of what happened to Cas, even though we don’t know for sure what actually occurred. All we know is that Dean kept looking for his angel, Cas split on purpose, and he was screaming out Dean’s name as we ended the episode. Is he really dead, as Dean believes? Or maybe he’s escaped from Purgatory on his own? If so, is Cas mentally stable after his experiences? All great questions that I hope we get to explore soon.